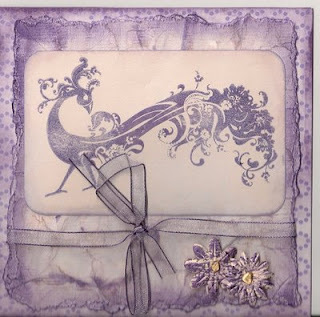 On this card I have used Distress ink for the edges and also created a backing paper using distress ink and perlescent mica powder spray. The ribbon was a white organza which was also given the once over with a distress pad as were the flowers. I love this card and the treatment - lovely design too. Lovely card and fab colour! Not usually a fan of the distressed look, but I really like this card. Well this is stunning - gorgeous stamp!